It’s one month till the election and the race for Rice County Commissioner District 1 is between Kathleen Doran-Norton and Jake Gillen; District 2 race is between Galen Malecha and Jeff Quinnell. If you’re looking for an online venue to discuss the races with your fellow Northfielders, this is it. I got an email last week from Stephanie Henriksen, alerting me that MotokazieLand (see my April blog post, MotokazieLand Recreation Park: sounds like a good development) has a new proposed location in Cannon City Township, south of County 9 (150th Street East) approximately mid-way between Hwy 3 and I35 (Dennis Shaw property at 1267 150th St. East). I spoke to Lee Theis, president and owner of Motokazie, a motorsports race promotion and track-building company. His application fits the county zoning so this will be a two-step process, ie, Rice County Planning Commission, then the Board. Since it’s not a request for a zoning change like last time, a simple majority of the Board (3 of 5) is required for approval. All the environmental studies are being done now. He expects it to go before the Planning Commission early in 2011. See the news page on his website for more. Our guest this week was District 2 Rice County Commissioner Galen Malecha, discussing the proposed MotokazieLand Recreation Park (PDF) in the highway commercial zone between I35 and Cty Rd 46 at Cty Rd 1 in Rice County. I’ve turned off comments on this post. Continue the discussion on my April blog post on the issue. Click play to listen. 30 minutes. You can also download the MP3 or subscribe to the podcast feed, or subscribe directly with iTunes. 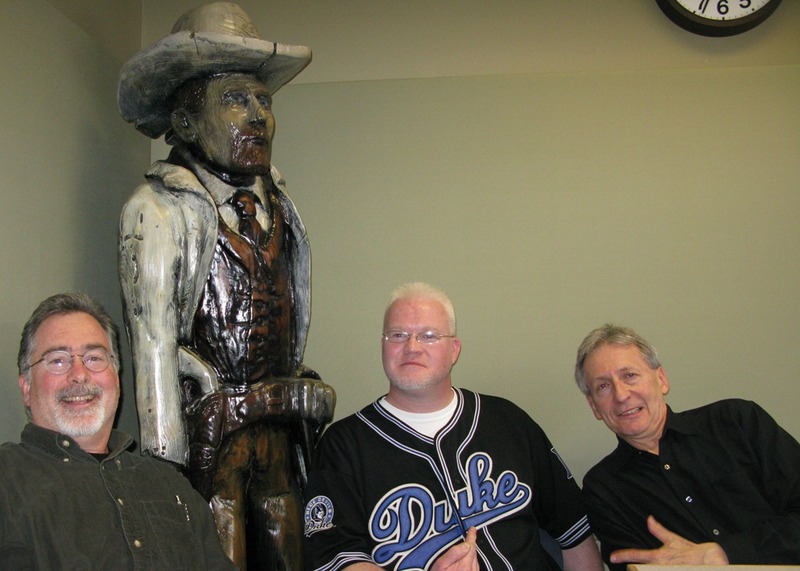 Our radio show/podcast, Locally Grown, usually airs Mondays at 6:00 PM and Sundays at 10 AM on KYMN 1080 AM. Our guest this week was Lee Theis, president and owner of Motokazie, a motorsports race promotion and track-building company, and developer of the proposed MotokazieLand Recreation Park (PDF) in the highway commercial zone between I35 and Cty Rd 46 at Cty Rd 1 in Rice County. 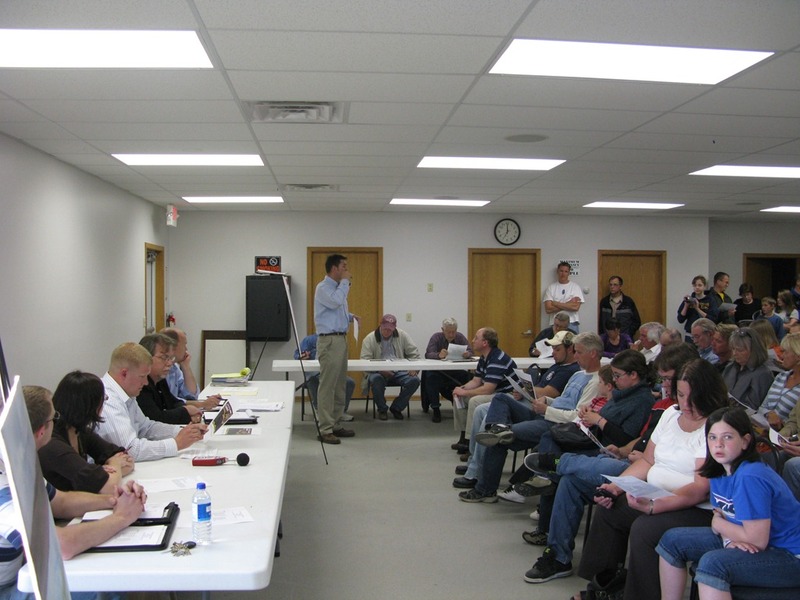 It was standing-room only at the Forest Township Hall in Millersburg last night. 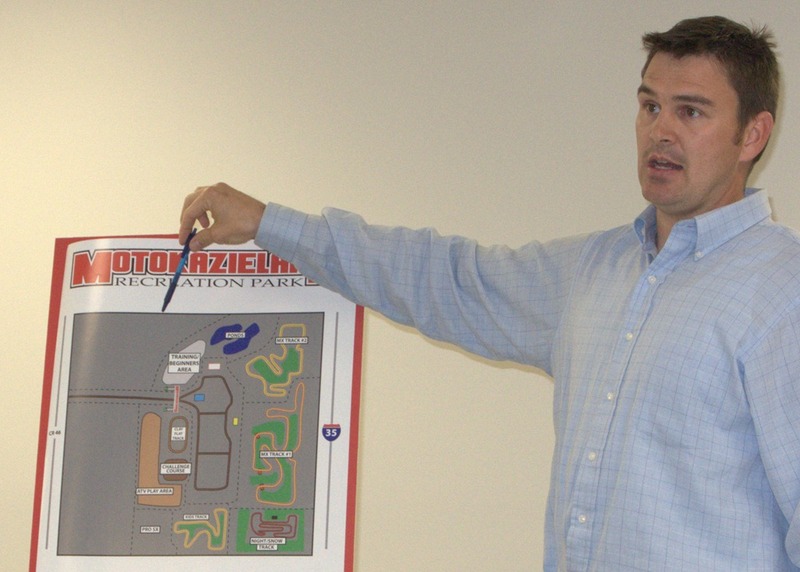 Lee Theis, president and owner of Motokazie, a motorsports race promotion and track-building company, made a presentation to area residents on the development of the MotokazieLand Recreation Park (PDF) in the highway commercial zone between I35 and Cty Rd 46 at Cty Rd 1 in Rice County. Theis needs approval from the Rice County Board of Commissioners because this kind of organized motor sports is only allowed in agricultural and urban reserve zoning districts. I stood at the intersection of Cty Rd. 1 and I35 and took this 22-second video to capture the sound of the freeway noise, as noise from the two motocross tracks is the concern raised the most by residents. Next up: a public hearing on May 6th, 7 pm, at the Rice County Government Services building in Faribault. See the website, Rice County Residents for Motorized Recreation (RCRMR) for more info on the MotokazieLand proposal. Supporters are asked to sign the petition and join the discussion on the Facebook group. The Faribault Daily News has a good pro and con discussion page titled: In their own words: The Motokazie debate.